Daycraft popped up on the blogging scene a little over a year ago with a line of fantastic daily planners and notebooks that were well made and attractive, but not available in the US (although in plentiful supply in Australia, China, Hong Kong, Indonesia, and the Phillippines to name just a few of the countries listed on their website). But it does seem that their wares have popped up in a few stores in the US according to their 2012 catalog, including some that have found its way to the Museum of Modern Art gift shop. Daycraft sent me several really nice notebooks to try out, including this Cheese Cracker notebook, one of three Cookie Bookie notebooks along with a square Oreo-type cream-filled cookie notebook that looks mouth watering and a lemon wafer that reminds me of Wafer Thins cookies. The Cheese Cracker notebook is just what it sounds like, a paper version of those orange and brown cheese crackers that are the staple of work-place snack dispensers around the US. The styling on this notebook is excellent--the paper is just the right tinge of orange, the leather-like cracker cover has the same tiny holes as you'd find in the snack, and the notebook is wonderfully square and portable. How well does it work? Very well, actually. The notebook is 4.75 by 4.75 and fits comfortable in a purse or knapsack pocket (but not in a back pocket). The paper is heavy and fountain pen friendly, no bleed through. The orange color is not so garish as to overwhelm the writing. And the line width of 6.5mm is wonderfully wide, I don't feel like I have to cramp my cursive scrawl like I do with some other notebooks. Take a look at Daycraft's catalog, they've added some great products (including a really nice looking camo concert notebook and their animal pals). Hopefully more retailers will offer Daycraft products, which are well-made and a lot of fun. 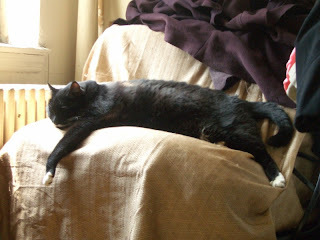 Bast's Gift, also known as the Big Boy and the Prince of the Apartment, turns 16 today--80 years old in people years. I happen to know his exact date of birth and almost the time, as my neighbor saw me in the laundromat on Memorial Day, Monday, May 29, 1995 and asked me if I'd like a kitten from the litter born the day before sometime in the afternoon. I had just lost my sweet VT, a tabby cat, a few months before and definitely wanted another so he came to stay permanently some weeks later. The marvelous Mia is making a watercolor of this photo, my favorite shot of his Majestic Catness, and I can't wait to see it. Last year's National Stationery Show feature was the black pencil with a sparkling Swarovski crystal on the end, beautifully-jeweled pencils that were everywhere. This year there were fewer sparklers around, but one that did show up was this plain black pen with a Swarovski crystal on the plunger. Looking somewhat like Parker Jotter ballpoints, these were displayed at several booths and have a suggested retail price of $4.95. The two new colors that are big favorites for the summer are teal and hot pink, and they are definitely beautiful. Nothing amazing about the pen, but the presentation is impressive. Great post by DIYSara and wonderful pics of the Chicago Pen Show, do go over and leave a comment at her site. Here's a pen of interest if you have an iPad or any other touch screen device (or just want something different in your daily arsenal), the Monteverde One Touch Stylus & Ballpen. This seems to be a redesign, starting off as a ballpoint and now re-engineered as a soft rollerball (the refill seems to be a cross between a gel ink and an oil based ink). The original had a flat rubber stylus that doesn't look like it was very easy to use for anything but tapping, while this newer version has a round soft rubber end that's actually quite usable for writing on the touch screen as well as tapping out notes and whatnot. The newer One Touch has a great pearlized lacquer finish as well, not the metallic body in the original, with a choice of ultra-vibrant (red, pink) or ultra-neutral (black, grey, white) barrel colors. The pen itself is one of the nicest I've used, the barrel is comfortable even without a grip and heavy enough to fit comfortably in the hand. The price isn't bad either, $30 plus tax for a nicely-designed pen that does work well with a touch screen device. I've enjoyed using it because I tend to work on my iPad, and tend to hit the screen with the end of my pen because I've left my capacitor-stylus somewhere else. This works well for me, now I just tap and go. Another National Stationery Show exhibitor that showcased its "green" line of writing tools and supplies is EcoVerte. The company has a number of lines that focus on recycled newspaper and plastic as well as a line of bamboo pens and pencils that are unusual-looking but not so weird as to be put in the re-gift drawer. From left to right above is a bamboo ballpoint pen (also comes in pencil flavor), a recycled plastic ballpoint pen, and a woodless pencil that's one of the nicest of its type I've seen (very simple one-color design). All are fun and functional, and if you happen across any of these in a local shop they are definitely something to consider adding to your lineup. One thing I loved about the recycled plastic pen is its shape. The barrel from tip to mid-section is round, tapering into an oval as you get to the end and the plunger. The clip has a beautiful soft, flowing curve while the clear blue barrel shows off all of the spring action at both ends. This pen's design is excellent and interesting, definitely check it out. Where to buy is again the question, but if you see any check them out. Yochanan has opened up shop at Multi Pen Dimensions, and his first post features the Lamy Accent 4 in 1 multi pen. Stop by and take a look, I don't remember seeing this pen at all in my travels around the pen shop. Part of the appeal of "green" products is that primarily they are familiar items made from recycled components. Notebooks made with recycled paper and plastic pens made out of plastic bottles are two standard green products. Moving along the continuum you get old favorites with a green twist, such as woodless pencils: essentially a graphite core wrapped in recycled newspaper. At the National Stationery Show I was introduced to a product that moves one step further, making a totally familiar product out of an absolutely impossible element in such a way that it helps the environment: paper made from rocks, or rock paper. The rock paper I played with was at the Urban Smart booth, where they were showcasing their line of dry erase stationery (itself a really great idea) and dry erase picture frames (which has some funny/dangerous elements to it as well). Rock paper, which is manufactured in Taiwan and sold under the TerraSkin brand, is three parts recycled calcium carbonate—the same mineral in marble and limestone—and one part polyethylene binder. Production of this requires no water or bleach and uses only half the energy needed to make traditional paper. The resulting material is durable, and recyclable, breaking down into a talcum-like powder if exposed to sunlight and humidity long enough. What I found amazing about this paper is that while it feels very thin, there was no bleedthrough with either a gel ink pen or a fountain pen. The paper absorbed the ink, but other than a bit of a shadow on the back side there was not problem with double-sided writing. The paper seems coated yet absorbent, and it has one of the silkiest textures I've ever felt. Now the question is: where can I buy it? I haven't seen any, so I'll be in touch with Urban Smart to see who's ordering their notebooks. The only downside I saw was the lack of a hardcover notebook option, but that may be in the future. Stationery Traffic has some reviews of the new Daycraft notebooks, including one from the Skinz line featuring a very cool skull. Check out the review and more (that was the one I wanted, lol--but the Daycrafters were very generous in sending me some notebooks for review, which I hope to have soon, so I won't pout...much). Seeing these Scandinavian Archie Grand notebooks at Notemaker made me smile, so I decided to add one to the order and get to work listing all the Secret Agents I've Met and Liked. As there aren't that many I've met, much less liked--none, really--I decided to use the notebook for other purposes. The small pocket-sized notebook is 6.5 by 4.6 and 120 pages of the thickest paper I've ever used. Cream/ivory is the color, but the paper itself is pebbled which gives the page an almost glossy look. The matte cover has a leather-like feel to it, while the color range is superb. But the fun part is finding your perfect person: capitalist, models, chefs, nobel laureates, Oxfordians, and many other types are available for your note-taking needs. The Archie Grand website notes that this paper really soaks up the ink, which is true up to a point--gel ink pens, such as my G-2 Knock, love this paper. Ballpoints are a distant second, while fountain pens should go elsewhere. The paper doesn't seem to absorb fountain pen ink very well, so I'm using Staples and Muji gel ink pens only on this. I'm thinking that this paper would actually be great for scrapbooking, as it's a heavy/sturdy type that won't wilt if weight is placed on it such as a magazine cutout or photo. The smaller notebooks is $11, the larger Jumbo priced at $26 and there's an online US store (Jasper+Black) that handles the line if you're interested in purchasing. Some of the new Ecosystem notebooks coming out soon, large and small hard and softcover dots. More new notebooks, with trompe l'oeil covers. These seem to be softcover only, if I'm getting that right. Finally, some of the specialty notebooks Ecosystem has made for clients. Yahoo! in grape, and the one of the right is for John Mayer (Dreaming With a Broken Heart). The Exaclair space at the National Stationery Show is always one of the largest, featuring the Quo Vadis, Rhodia, J. Hebin, G. Lalo, and other product lines all part of the French parent Exacompta. Karen Doherty, Vice President and generous supplier to many of us, was on hand to show off the new Rhodia products. I really wanted to see the new dotWebbie, and it is fabulous. This is the pocket size dotWebbie, and it is fabulous. Ivory paper and pale gray dots make for a less obtrusive writing experience. The darker violet dots in regular dotPad paper are a darker (albeit still lovely) shade and catch the eye. This combination is probably as close to writing with blank paper as you can get but still having the lines marked out for you. Next is the soft cover bloc notepads, which is more of a tactile experience than a visual one. The cover is some sort of velvety-suede type of stock that feels amazing. It's a subtle difference but one that will make you take notice. Finally, there is the Rhodia Unlimited pocket notebooks. Like the smaller Rhodia stapled notebooks, but with some major differences: first, there's an elastic band closure with a racing stripe in the opposite color (black with orange stripe) so it's stylish and fun; second, the paper isn't merely lined but blocked out. The picture doesn't show it, but the pages have defined rectangular outlines for notes as well as an upper rectangle for date and memo (reminds me of several Japanese notebooks, such as Mnemosyne and Kokoyu). This looks like it will be a great addition to the line up. Many thanks to Karen for showing my friend C and me the new products (that's C's hands in the photos), and for the invitation to stop by for a tour. Definitely planning that soon! Spent the day wandering around the National Stationery Show with C, checking out all the great products, cards, stationery, and anything else that came to town this weekend. Probably the most interesting item I saw was paper made from crushed rocks, which I have pictures and samples of to feature in a blog post later on. But what an amazing silky smooth texture this rock paper has! And the notebook I sampled with a fountain pen showed no bleed through, making this a very worthy possibility if you're looking for something to add to your lineup besides an Exaclair product. (The looks on the reps faces when I pulled out my vintage Sheaffer balance was priceless, and I was pleased when one of them mentioned that she loved blogs--thank you!). More pictures to follow, as well as photos of the new Exaclair products (got to meet Karen Doherty, who showed us the dotWebbie, Softcover tablet, and the Rhodia Unlimited notebook with black and orange elastic closure) and the new Ecosystem notebooks (multicolors!). RevolveR notebooks has some new colors in its lineups, love the orange! Got to meet up with the guys from Contact Keepers (finally), and see their really great binder close up. Paper flowers were popular, and lovely. Wrist bracelets in different colors that are erasers as well as fashion statements. Some nice recycled pens, made out of plastic bottles. The Mead area, featuring some wonderful Beatles notebooks, a Justin Bieber notebook (bottom right), and a softcover featuring symbols of 3 of the Hallows from Harry Potter (upper left--the wand, the ring, and the cape for fans of the movie). Zombie unicorn figurines from Tokidoki. The National Stationery Show begins this weekend at the Javits Center. I've a guest once again of my friend's mother, who has her own small business. C and I will be hitting the aisles looking at cards, paper, gifts, figurines, and whatever else is on hand. Should be a fun time on Sunday! The Zebra G-301 gel ink retractable has one of the better designs among re-usable pens that I've seen, all black rubber and stainless steel with a substantial clip that won't snap off or get tangled up in fabric. It's a spare, modern look that works well in the office (with the grown ups) or on your own just doodling. The medium gel ink retractable has a 0.7mm tip that seems a bit wider to me than others I've used. On blank paper it would be fine, but with smaller line widths or gridded paper it might seem too large for writing within the space alotted. Whatever else, the Zebra G-301 is a great addition to the pen line up: reliable, readable, and comfortable. Great post on life with a medium nib TWSBI at Scriblets. I was looking at this Uni-ball Jetstream multi-pen on eBay for some time, and decided to give it a try. A three-color multi-pen, this luminous black pen has silver accents and a very heavy silver clip but it remarkably light. The pen tips are 0.5mm, but seem like a 0.4mm or lower--the line width is quite thin, although it is very readable and doesn't get too lost on lined or graph paper. I thought I'd try it out on my dot ring binder, and definitely like the way it writes in blue, black and red. These are some of the nicest looking gel inks I've used: the red is solid, not pale, and stands out against ivory paper. The blue is deep and rich, while the black is dark and interesting. There's a touch of blobbing, that dreaded oil-based ink problem that leads to smearing, but nothing particularly excessive that a few extra seconds of drying won't clear up. One detail I like is that you twist the barrel to change color, with three dots labeled black, red, blue on the silver band, with a blank space in-between when the pen retracts. I like this much better than pushing down a colored tab on the end of the pen, and with this feature I don't accidentally retract the pen with I'm writing by hitting the tab. There's a small clear jewel on the end of the cap, which is a nice design detail. The only pen I've seen available online is at JetPens, the Jetstream F* series with two inks and a pencil feature. 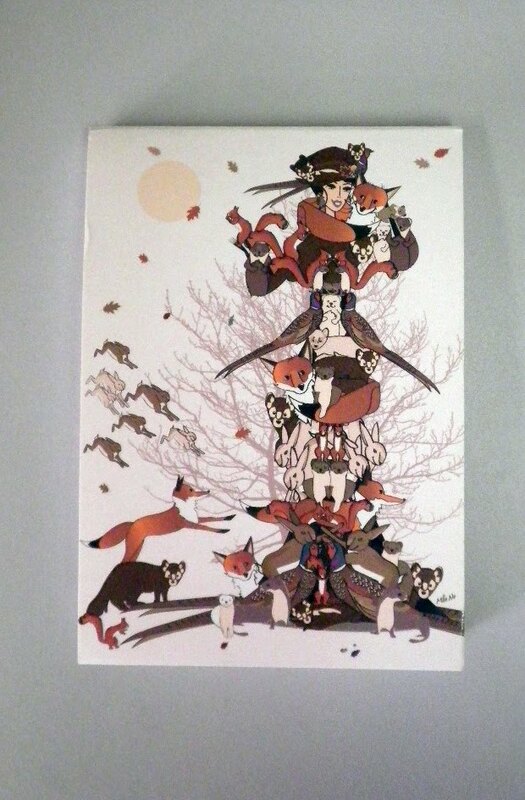 I'm more inclined to the three inks, which Taizo may be offering again at his eBay store. They are similarly priced, so if multis are your thing take a look at this one at either store. Economy Pens is hosting the May Carnival of Pen, Pencil and Paper, and there are a lot of great posts to read. Do stop by and take a look. One of my favorite Clairefontaine product lines is Mlle No by Jessica Ollivaud, particularly this stylish woman from the turn of the last century (maybe 1911 or so) wearing all sorts of furry animals instead of their fur. 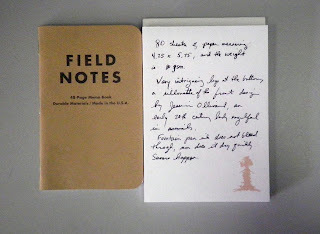 I hadn't seen this memo pad among the notebooks, but found them at University Stationery on E. 12th Street in the heart of New York University and the Village. I liked the size immediatly, around 4.25 by 5.75 for the paper, which is wonderfully silky 80 gsm and bright white. A good size for notes and jottings, fits in the purse quite well, and is fashionable. 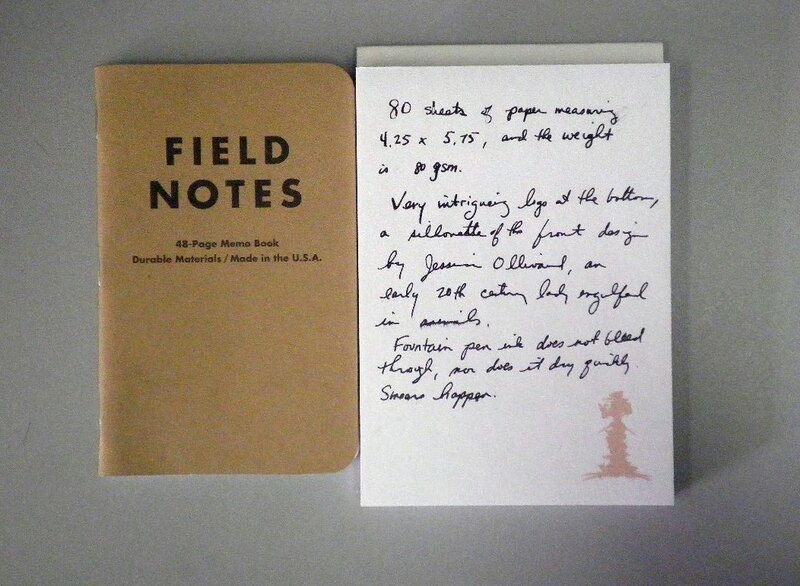 Here's the open memo pad next to a Field Notes for size comparison. At the bottom left of the memo pad is a wonderful pale tan silhouette of the lady on the cover, which adds just a touch of whimsy to this little book. The entire presentation is fun and good-looking, something to think of adding to your desk or bag. Pentel's Oh! Gel retractable gel ink pen is one of the largest pens, diameter-wise, that I've used in a long time It's a comfortable pen, the grip is soft rubber and the pen itself has great "hand feel" to it--not too heavy, not too big, but definitely noticeable next to all those skinny Pilot Hi-Tec gel inks. Staples carries 5 packs of these pens, one pack in all black and one in a black-red-blue assortment which is what I bought. This blue is very dark, one of the darker blues I've seen in a gel ink pen that isn't a blue black. It's also got a thick, 0.7mm line width that isn't too big for my taste. The ink dries fairly quickly, so smearing shouldn't be a problem. The barrel has a nice diamond patter that's distinctive, while the clip is substantial without being heavy. If you're looking for a substantial gel ink pen, one that you can't possibly loose among the clutter of your desk or bag, the Pentel Oh! Gel ink pen is something to check out. One of the Muji double ring notebooks that caught my eye was this one, a 5x8 notebook with a vinyl folder on the outside for pens and papers as well as a gray cotton elastic band to keep the notebook closed. I tried out a number of gel ink pens, some Sharpies and Staples OXO pens, and a few different fountain pens. As you can see, almost all had a heavy shadow on the back side of the paper if not total bleed through. This is paper meant for pencils and ballpoint ink, or someone who doesn't mind writing on one side only. I like this notebook, however, and plan to take it along with me for work notes and jottings. The biggest problem next to the paper is that the notebook won't lay flat if you have pens inside the vinyl folder. So basically it's a great idea that looks good, but execution needs a bit more thought.